SMART ARCHITECTURAL ALUMINIUM showcased a range of products at this year’s Futurebuild exhibition, including its Designer Door, Alitherm Heritage, Visotherm and MC 600 ranges. 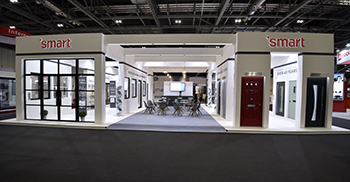 Managing director Eddie Robinson said: “This year, our Designer Door system took centre stage on our stand, with a range of style and colour variants on display, alongside a number of our new door and window products. Our display also featured our proven Alitherm Heritage system, which this year we showed in an art-deco style screen display. Among the range of new products was a faceted MC 600 display, as well as a screen and door set to showcase the Smart Alitherm Heritage system, featuring a combination of casement and tilt & turn windows, and double doors. or telephone 01923 461527, mobile 07977-981753.